We have commented before about how 2013 has been the year for fitness technology thus far, and more critically how some of the largest players in the wider tech market have gotten involved. Wearable fitness tech has never been more in-vogue, but also, we are increasingly seeing fitness technology been applied to more traditional fitness tools. There’s probably nothing more traditional in the fitness tech world then running shoes, and so far this year we have seen Nike and Adidas stepping up their game and taking things to the next level. Both brands have the technology to boost your performance, with Adidas pushing their Adidas Boost trainers and Nike introducing their Nike Free range. Both the Boost and the Free are slick looking running shoes, adorned with snazzy stitching and laden with techy buzzords, but do they deliver on the premise of actually helping us to run faster? Lets delve a little deeper, and pitch the Nike Free 5.0 verses the Adidas Energy Boost. Update: We summerised our findings in the below video. I have pitched the two shoes against one another on a typical run that i do outdoors, as well as across two gym based workouts. With their meshed black exterior, with its lightweight, meshed design, the Adidas Energy Boost trainers look like a serious training aid. They lack the bright, flash design which Nike have gone for, but manage to deliver a dark, menacing, high performance look. 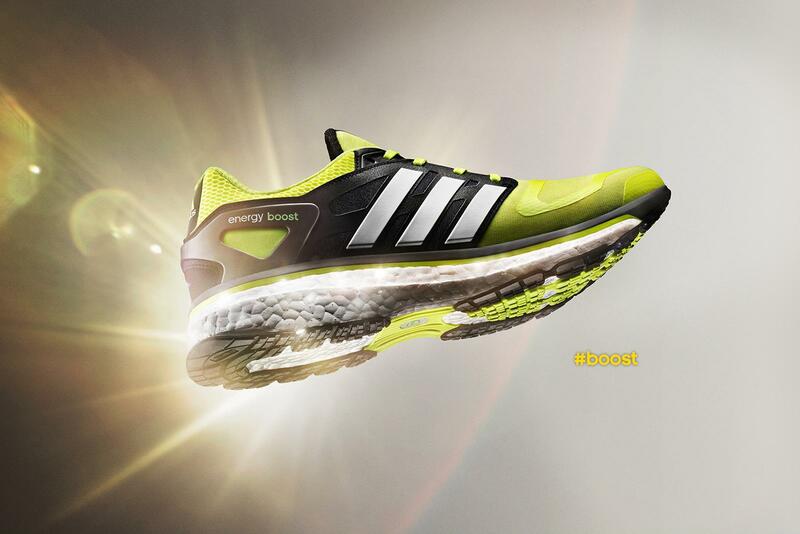 Of the two shoes, the Energy Boost has the more defined sole and the lighter feeling support. Whilst the Nike Free’s look like a relatively standard, higher end pair of running shoes, the Adidas model feels higher tech and looks more advanced – although this obviously means nothing and is purely personal preference. 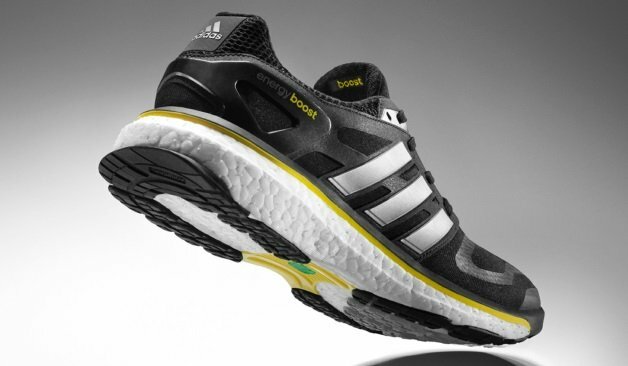 The Boost’s sole is its selling point, as should be the case for any serious running shoe. It’s premise lies in the idea of energy recycling, meaning that your can get more bang for your buck with every stride that you take. 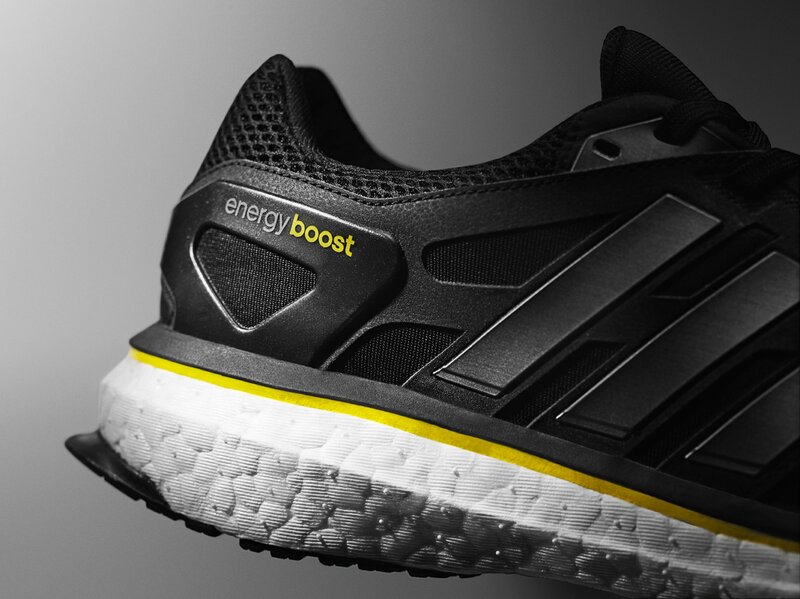 Designed as a set of interconnected capsules, the Boost is designed to provide “the highest energy return in the running industry while combining usually conflicting performance benefits”, says Marcus Wucherer, category manager running, at Adidas. Wucherer goes on to explain that the standard EVA material found in running shoe soles means that the runner always has to compromise. In essence, until now you have had to choose between a sole designed to be responsive, which is generaly thinner and lighter, or one designed for cushioning, which is thicker and more comfortable, but it comes with a performance compromise caused by less flexibility and a heavier net weight. The Nike Free 5.0 is really a very different prospect compared to the Boost. Its premise lies in the fact that Nike believe we were born with some wonderful running tools – our feet – and that the aim of a running shoe should lie in freeing up those feet. Superficially, this appears to be marketing jargon aimed at capturing the buzz around the barefoot running craze, but Tobie Hatfield, who designed the Free 5.0’s claims that Nike have developed some stunning “natural technology”, which comes on the back of 12 years of research into athletes training barefoot. Essentially, they studied the feet of top tier athletes in training, analysed the way their feet flexed under stress and reverse engineered the whole process to re-build their running shoes. By understanding the runners foot, they could build the perfect shoe to augment their training experience without them feeling like they’re even wearing a traditional training shoe. Design wise, the Nike shoe is far more conspicuous than the Boost, designed in a standout blue and green combination. Featuring bright white soles, a blue body and a green inner sole, heel and laces, you can be sure that your not going to be missed wearing the 5.0’s. I wanted to take both sets of running shoes out for a true road test, as I imagine most people interested in dropping this sort of cash on a pair of running shoes, are likely to be outdoor runners. I’ll come to a gym comparison below. I therefore planned out a nice circa 5K route using MapMyRoute. I wanted to test both pairs of trainers on a mix of on-road surfaces, including smooth tarmac, concrete and some slightly rougher degraded harder surfaces. I mapped my run to take in my local park, which allowed a quick sprint over some tennis courts that are in need of a re-surface, which was about as good as i could do for this test. I wanted to test both pairs of shoes in identical conditions, which for the sake of fairness, i decided that a dry day, with no standing water or otherwise adverse conditions to contend with would work best. Fortunately, last bank holiday weekend included a nice warm Sunday and Monday. I wanted to be equally fresh for both shoes, so i choose adjacent days to trial them. I didn’t want to complete one run, which for the sake of giving these a proper go would need to be quite tough and challenging, only to impact my performance in the next pair. My overriding first impression with the Nike Free 5.0’s was that they are fantastic for encouraging a natural, healthy running style. I have been a serious (enough) runner for 6 years now, and in my earlier days i experienced a good deal of pain in the outside of my right knee after i stepped up the volume. This was caused by my ‘heel-striking’ running technique, which essentially meant that every time i took a stride, i would land on my heel before my toes. The correct running style, which i have had to remain very conscious of to this very day, is to land on your toes a split second before your heel hits the ground. Barefoot running is very effective in promoting the proper running style, and i was super-impressed by the Free 5.0’s ability to naturally make me land on my toes. This feature alone will save a lot of injuries amongst all levels of runner. The Nike is truly effective here because you can feel the power in your stride when your land on your toes – the flex in the shoe seems to really help you put your power down – and you therefore find that you have a big incentive to run properly. I imagine that regular runners would quikcly discover this with when using these shoes, even if they were not concious of the need to land on their toes. The sheer flexibility of the 5.0 does this, as it has none of the sole stiffness which is so often the root cause of the heel striking problem. During the high intensity sprint sections of my run, i noticed a real benefit in using the Nike 5.0’s compared the Energy Boosts. Sprinting speed relies heavily on technique, especially at the start of the sprint. You can really get off to a flying start with these shoes, and the extra stride power can ten really kick in. 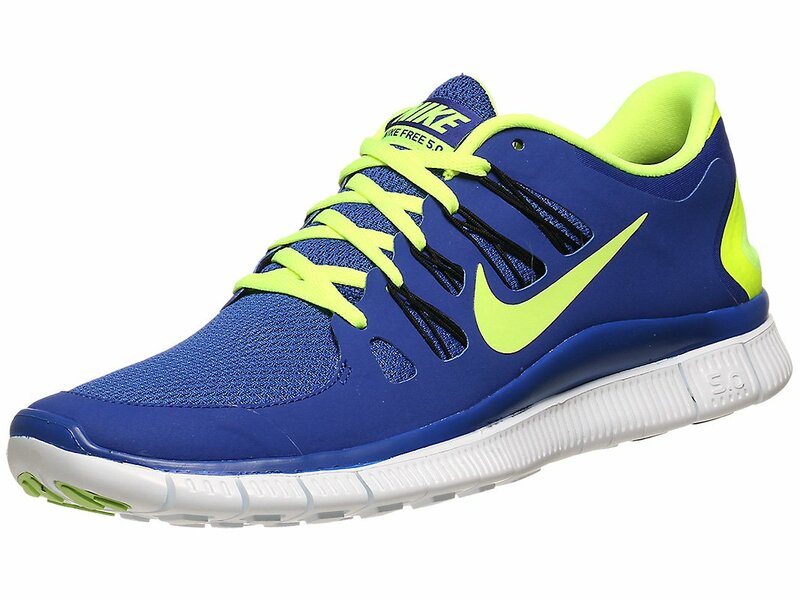 If you are planing to do a any sports that require quick bursts of speed, then the Nike 5.0’s are the pair o shoes to buy. Where the Nike’s really excelled suring high intensity bursts, the Adidas Boost’s were exceptional over the longer, more steady paced, distances. Over longer distance runs, your not going anywhere near as fast, and therefore you don’t rely on the prounounced toe flex to power you – its much more a game of rhythm. The additional support offered by the Adidas Boost shoe really comes into its own over the longer distances, and i found it to be much more comfortable. By the end of a stiff 5K, my feet felt great, with none of the slight toe strain and general aches that some of my thinner soled standard running shoes can give me. You need to settle into a nice steady running cadence before you start to feel the uplift from the Boost system. For me, this meant covering around 0.5KM, and at this point the energy uplift became surprisingly pronounced. I desperately believed that this idea of mixing responsiveness with comfort was marketing jargon, but the affect of the boost system is very real. One side effect is that the extra speed comes at a cost, as the Boost’s encourage a different running style, which transfers a lot of additional strain on to your calf muscles. I would estimate the effect is similar to adding an incremental 2 percent incline to the run, although that is purely in terms of how your calf’s feel. No doubt frequent use would lead to adaptions here though, and there are always quirks with the first proper use of some new running gear. For the purpose of a 5 run, the additional support and comfort offered by the energy Boosts was telling, and I found them to be much more effective here. I felt it was important to road test these running shoes in a true road environment, largely because that is the environment where most people will end up using them. That said, I am more of a gym trainer personally, so naturally i took both pairs of shoes down for two workouts each. The aim here was to insert them into my regular training schedule. Whilst strictly running shoes, most folk investing in these kind of training aids are going to have mixed uses for them, so lets make this a proper test! Workout two was a cardio session in the gym, using the treadmill, rowing machine and the spinning bike. The session was 75 minutes long, comprising of 30 minutes of varying intensity treadmill work, 30 minutes of spinning and 15 minutes of rowing intervals. I put both pairs of shoes through my lower body session, which, relevant to the shoes you’re wearing, includes squats, leg presses and toe presses. I found that the Nike’s flexibility was largely a real bonus here, and i now rea lise why a lot of old school bodybuilders used to train barefoot. The additional feeling and stimulation that you get from soles flexibility was amazing, and i really felt some strong DOMS the next days (muscle soreness from the workout). Bearing in mind that this is not a new workout for me, i was pleasantly surprised by this. The Adidas Boost, in comparison, felt too cushioned and the energy boosting elements brought no advantage in an environment where your foot remains rooted to the surface. Where the Nike Free 5.0 let me go really deep on exercises like squats, i found the Energy Boost shoes to be in-flexible and limiting here. Post my weights workout, i usually go for a 25 minute blast, typically on the treadmill, and as this is a HIIT session it involves rapid changes of pace. This really did not play to the Adidas Boost’s strengths yet i found the 5.0’s to be a real joy in this part of my session. My second workout is more of a mashup – i train to hit a calorie goal which is dictated by my heart rate monitor, but for the purposes of this trial, i choose the same workout. My cardio style is really varied, but i have some standard tools in my armory which i rocked out for this test. First up was the my old foe, the treadmill. Using a Lifefitness model, i decided to use a built in programme, as this would be easily replicated. I choose ‘random’, which uses a series of hills which rapidly changes to deliver variety. This was set to a single pace, wit the changes in intensity and HR coming entirely from the changing incline percentage. Here, the Adidas Boost were amazing, as the workout really played to their strengths. My single, steady pace was perfect for getting into a nice steady cadence. I also noticed that the energy boost was a real training aid on the steeper inclines, positively powering me up the tough parts. The Nike Free 5.0 were far from bad here though, as once again their flexibility and toe power discouraged heel striking. They lack the comfort of the more refined, long distance specialist Adidas shoes though. This was a time based test, and I don’t have any solid data to share on performance uplift, however i got off the treadmill feeling really impressed by the Adidas shoes, whilst feeling pretty neutral towards the Nike’s. It was a case that the Adidas shoes had really brought something to the party here. Phase two of this workout was on the spinning bike. I completed three Tabata bursts interspaced by 6 minutes of steady riding, giving me 30 minutes on the bike. Whilst the Adidas energing boosting system needs your foot to leave the ground, it was obviously going to bring nothing in that regard, yet i still found that they were the better shoe on the bike. The Nike’s soles were that little bit thin and little bit too flexible, meaning they brought my calves into play again whilst causing some blisters on my foot. I have had this problem with other thin soled shoes on the spin bike, but bear in mind that my Tabata protocol involes 3 sets of 4 minutes, which divides into 8 all out bursts of 20 seconds with 10 seconds rest in between. Tabata’s are about as intense as exercise comes, and the all out nature of them puts immense strain on your feet. Maybe not the fairest way to test the shoes, but again, i am trying to execute a real life test of both shoes, as i would use them. Phase three was a torrid 15 minutes of rowing intervals, one all out minute followed by 1 30 seconds rest, for 15 minutes, On the rower, the Nike’s came into their own. The toe flexibility was really effective in the bottom position, allowing me to really explode off the blocks. Once again, anything involving high intensity seemed to (bar the bike tabata’s) play into the Nike’s hands. Much like the Nike’s on the treadmill, the Adidas offering was rather neutral, neither aiding nor hurting the session. Verdict – a tough call, but the Adidas shoes probably just get this one. Firstly, both of these shoes are bringing some great new fitness tech to the table, and are commendable offerings from both Nike and Adidas. These are two radically different pairs of running shoes, and are a little bit like comparing chalk and cheese even though they serve identical purposes. It is clear that the Nike shoes are a lot stronger during activities that involve shorter, harder, higher intensity bursts of energy. They offer a wonderfully flexible, barefoot style sole. I genuinely believe that this could help runners of all levels to avoid injury, notably those caused by heel striking. 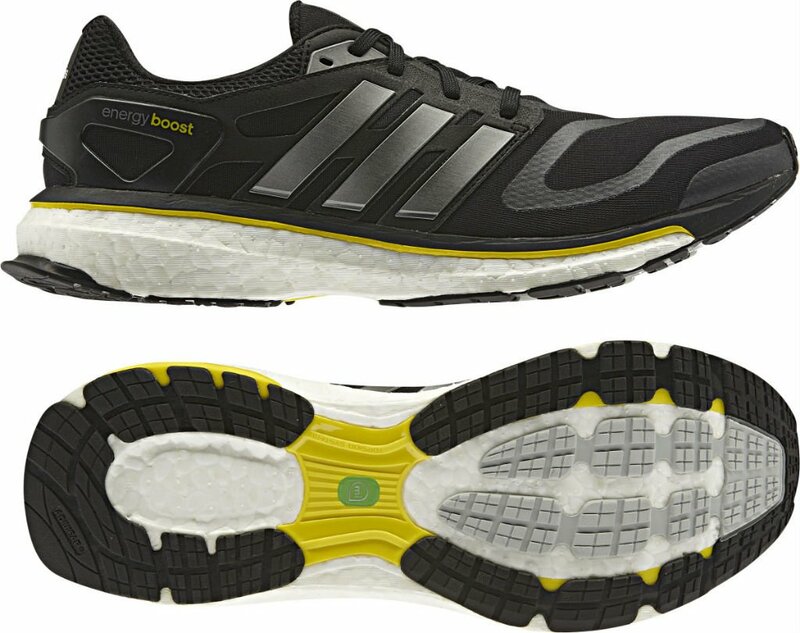 The Adidas Energy Boosts offer almost unparalleled levels of support and comfort over longer distances. They actually did improve my speed, and i think i could use these to really push on and do some damage to my endurance PBs. They lack the all round versatility of the Nike’s though, so your decision here will depend a lot on what you would use the shoes for. 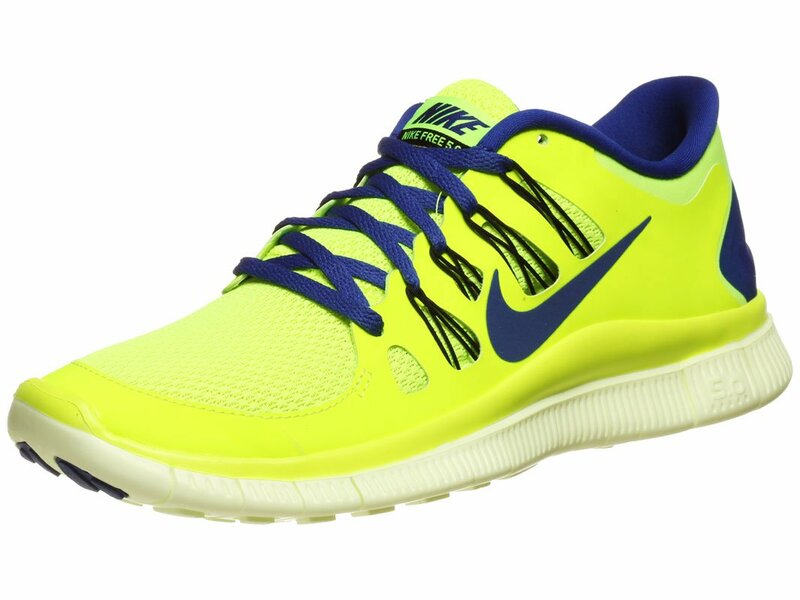 For me, i would purchase the Nike Free 5.0’s. I am a multi-faceted trainer who prefers to spend time in the gym, rather then on the roads. I play a mix of sports which involve quick bursts of pace and changes of direction, and i loved what the Nike’s cold do or me here. Moreover, i regular train hard in the weights room, and i loved how the Nike’s replicated an old school, barefoot feeling on the big Olympic lifts. Squats are never going to be fun, the Nike’s help you out and allow for a killer range of motion. They work well on the treadmill, especially if you use a lot of intensity techniques. All of that said, lets not dismiss the Adidas shoes. There were elements to these that i loved, and i i was more of a distance athlete, then these would win everyday of the week. Saying as we are comparing RUNNING shoes, its only fair to point out that these shoes performed better on pure runs. They were quicker on my 5K route and delivered a genuine energy boost. Its staggering fit tech really, and shows some real innovation in the running shoe sector.